A perennial garden design consists of plants that live for two years or more. Rather than dying every year and returning from seeds, these plants reconstitute themselves every spring from roots that survive the winter. Some of these plants produce beautiful flowers, while others contribute a wide range of shades of green. For the serious Houston landscaping client, they represent a long-term investment in a lasting curb appeal that will define the scale, scope, and geometry of the property for years to come. Gardens that are developed with these hardy plants dramatically improve the aesthetics of even the smallest of yards. In a market where curb appeal matters more than it has for many decades, investing in the high quality aesthetic that this kind of garden offers is a wise move to make. 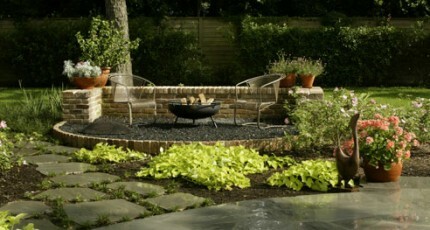 It is even wiser to develop your perennial garden ideas in partnership with a professional Houston landscaping firm. While the ideas will remain uniquely your own, your Houston landscape developer can further develop these personal concepts into forms that compliment your, upgrade its curb appeal, and create an environment that supports your individual outdoor lifestyle. While every garden that we plant is to some extent or another customized to the particular residence it works to support, there are certain characteristics that most of the plans we develop have in common. One of these characteristics is the garden’s ability to create a powerful compliment to home architecture. Contrary to the preconceptions of many persons, complimenting home architecture has very little do to with building structures in the yard using materials identical to those used in home construction. Rather, it has far more to do with mirroring color schemes and geometric patterns characteristic of the appearance of a particular home. Perennial flower gardens are very well suited to performing both tasks. Brightly colored homes with a warm, inviting appearance can often be beautifully complimented with perennial gardens whose colorful flowers both correspond to and indirectly reflect the colors of brick, stucco, or painted wood. Along similar lines, homes that are very elegant and Old World in design can be supported with more formal garden styles that consist mainly of evergreen plants. In fact, very few formal gardens of any kind are ever planted using annual species because formal gardens symbolize a form of stability more readily established by plants, shrubs, and small trees with long life spans. These gardens can be large or small, formal or informal, depending on the home, yard, and size of the lot. Regardless of its particular size, a professionally designed garden always impacts the scale and scope of any Houston landscaping plan. Small perennial gardens have applications in yards of all sizes. While we often think of homes like cottages and townhomes as naturally having small gardens that correspond to their size, many large yards benefit just as much from small garden design. In backyards that span more than an acre, the landscape can quickly overwhelm the eye with a feeling of too much space. Breaking up the yard into zones of interests is necessary to create a more comfortable feeling of controllable, predictable outdoor living. Walkways, patios, courtyards, and small gardens are often combined in ways to create multiple, more intimate, living environments out of a very large expanse of yard. It is also wise to trust your Houston landscaping professional when he or she recommends specific plant species that you may not have considered as being important to your perennial garden plan. Balance is a phenomenal that we consider fundamental to the success of any garden of any kind, so an appropriate number of plant species and plant sizes must be carefully chosen. Gardens must look alive and vibrant, but they must also look controlled, orderly, and sculpted. Having too many different types of plants can make the garden look too wild, random, and uncontrolled. Too few plant species can make it look boring. When it comes to determining just how many of each type of plant you want in your perennial garden, always trust the guidance of your Houston landscaping expert. What is Perennial Garden Design?